Grip-Tack captures and seals residual contaminants that are present before, during and after demolition or removal projects. Its unique formulation locks down asbestos fibers, lead paint chips and dust to ensure final clearance after the removal of lead and asbestos. The sticky finish traps lead dust and airborne fibers making it ideal for over-coating lead paint or asbestos prior to removal or demolition. Grip-Tack is also used as a lead paint adhesive primer over high gloss surfaces containing lead paint. Inspect all surfaces to be treated to insure they are clean, dry and free of all foreign matter including: dust, rust, grease, oil, mildew, glue size, calcimine, wax, soap, loose paint, etc. Patch and repair irregularities in surfaces with an appropriate patching compound. Allow to dry and wet sand smooth. Using a brush, roller or airless sprayer; apply Grip-Tack at a rate of approximately 200 sq.ft. per gallon. Grip-Tack should be coated with L-B-C Lead Barrier Compound one hour after application. Structural components previously painted with lead based paint should be over-coated with Grip-Tack prior to their removal. Grip-Tack’s outstanding adhesion and soft tacky finish traps lead dust and minimizes lead paint chip contamination. Grip-Tack should be spray applied at a rate of 100 to 200 sq.ft. per gallon over the entire component system. LOCKDOWN: Grip-Tack will bind residual lead paint chips and dust for final dust wipe clearance, and provide a primed surface which can be top-coated with a 100% acrylic latex paint. Apply Grip-Tack to all surfaces prior to demolition or component disassembly. Grip-Tack’s adhesive membrane helps prevent surface particulates such as fibers and dust from becoming airborne by binding them together and locking them down to the surface. Airborne particulates will adhere to Grip-Tack’s soft tacky finish to help minimize environmental contamination during demolition and component removal projects. 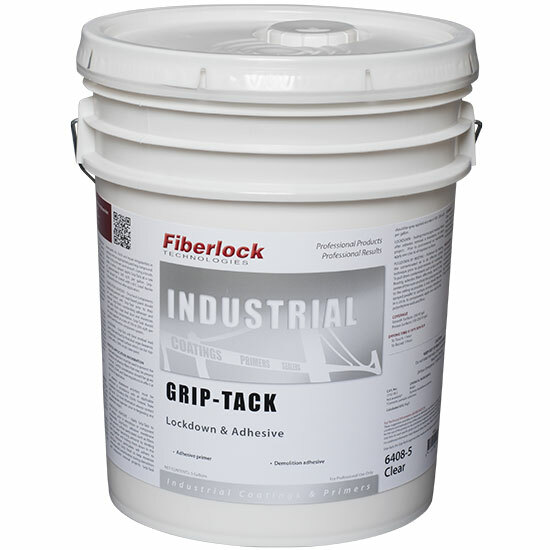 Grip-Tack should be spray applied at a rate of 100 – 200 sq.ft. per gallon. Sealing microscopic residual fibers after asbestos removal is mandatory on every project. Prior to post-removal air monitoring, apply one coat to all exposed surfaces. Pulldown by misting the contaminated air is an effective control technique prior to post-removal air monitoring. To pull down contaminants such as dust and free-floating asbestos fibers effectively, stand in the center of the room and hold the spray gun as close to the ceiling as possible. A mist should then be sprayed parallel to surfaces in every direction or in a circle. In containment, apply one coat to the polyethylene walls and floor. Smooth Surfaces: 200 sq. ft.
Porous Surfaces: 100-200 sq. ft.
Clean tools and drippings with warm soapy water before coating dries. Follow equipment manufacturer’s directions to clean spray equipment. Dispose of all waste according to current local, state and federal regulations. Store in a dry place at temperatures between 40°F (4.5°C) and 90°F (32°C). Stir thoroughly. Do not add solvents, oils, or colors in oil or mix with other coatings. Do not apply when air or surface temperature is below 60°F or when drying conditions are poor. Use adequate ventilation. */✦Click here for information on cleaners, stain removers, and mold resistance product performance.